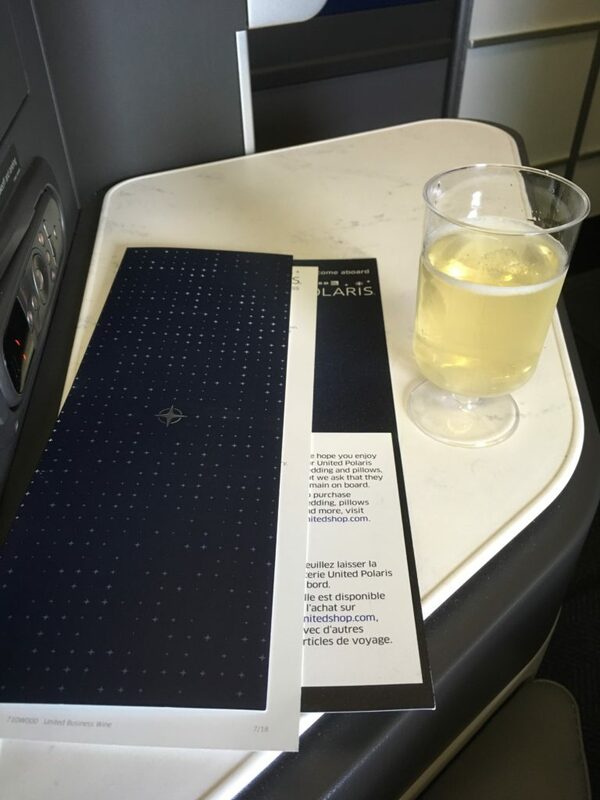 One thing I like about flying to Europe out of DCA is that it requires a connection, which means any thoughts of going into the office are unrealistic. Got a bit of work done from home, had plenty of coffee, and despite sleeping in managed a very leisurely stroll to DCA to catch my initial flight to Chicago in order to get this thing started! 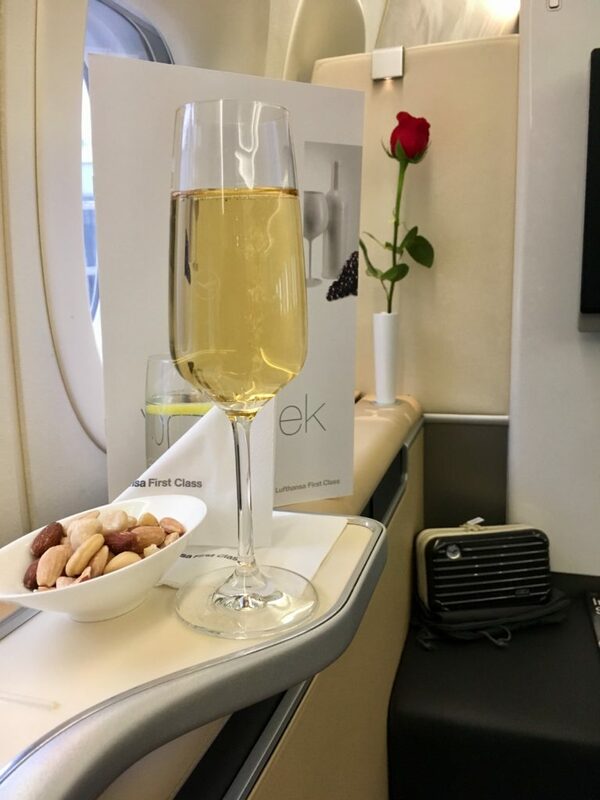 I had noted on the seatmap that despite first class being full, economy was only booked to about 30 people – completely empty! I considered moving back and taking a whole row to have a little more space, but decided not to risk it with snacks and drinks. 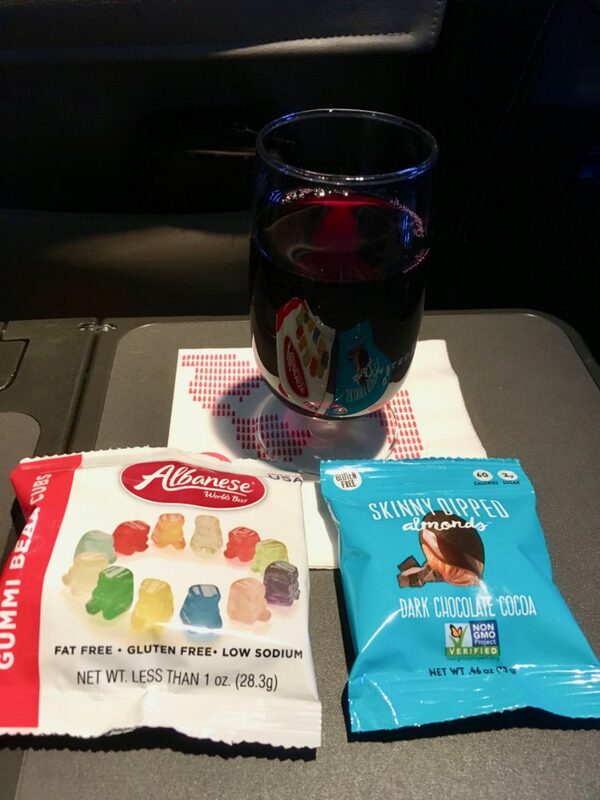 Interesting options in the snack basket today, so I opted for the fat free, gluten free, low sodium, low taste gummi bears knowing I would get much much better ones in a few days in Germany. 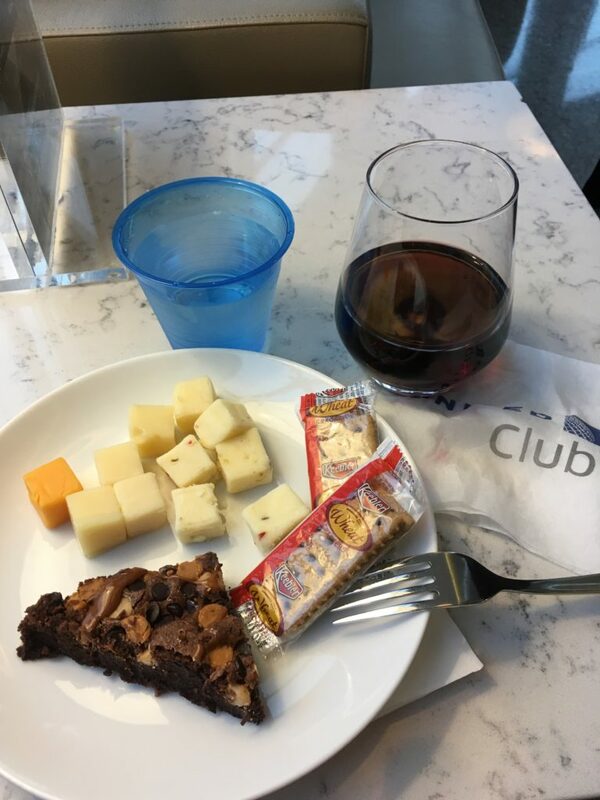 Beyond that, it was a typical, boring short domestic flight so I’ll skip right ahead to why I chose the flight with the 3.5 hour connection in Chicago: to give the Polaris Lounge one more try. This also had the benefit that if there were to be any winter weather surprises, I was leaving myself plenty of cushion before my international flight. No worries today, and we actually arrived Chicago a little bit early, so off from the B terminal to the C terminal to enjoy the Polaris Lounge. First impression: the lounge was as empty as I’ve ever seen it, which always helps to make a more positive impression. It did fill up quite a bit by the time I left, but initially it was empty. 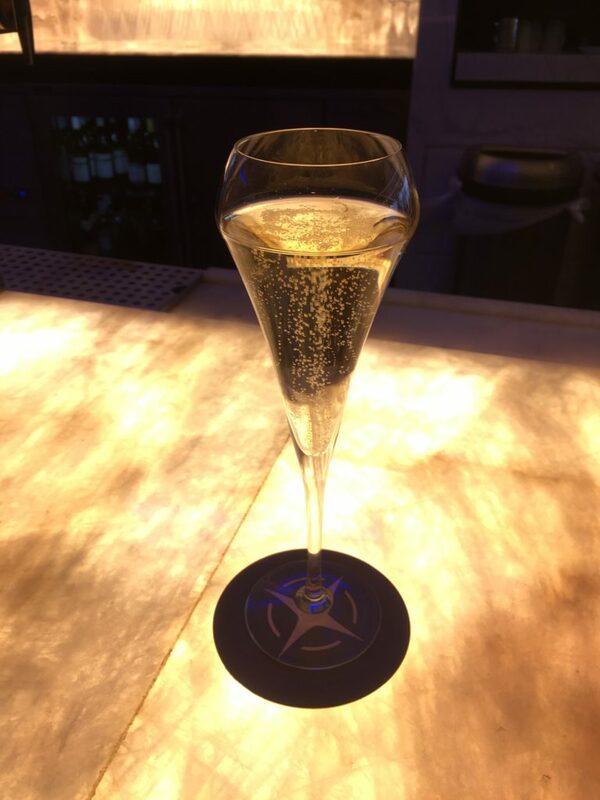 Glass of Veuve Cliquot at the bar to start things off while I finished up a bit of work. 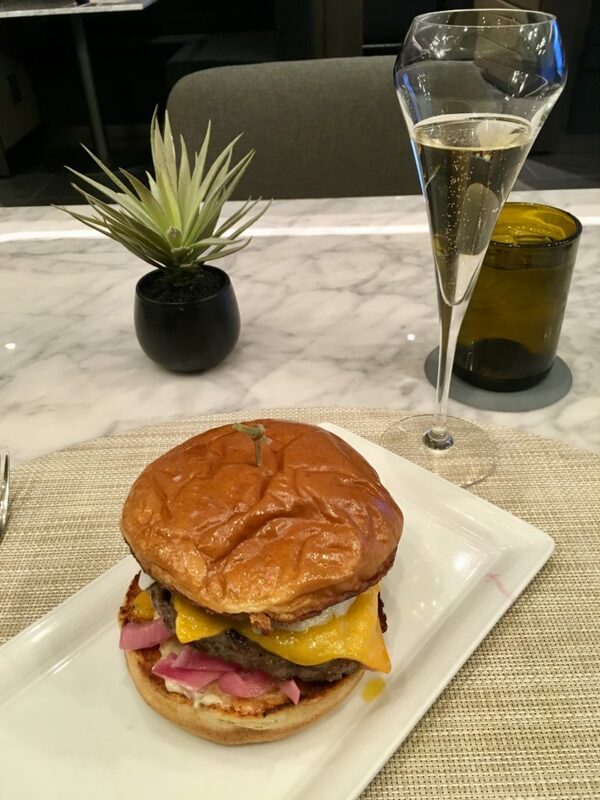 I had heard many good things about the Blue Door Kitchen Burger, so decided to order it – fried egg and all, and promised myself I’d only have a few bites to try it. It was pretty good, and ended up finishing a bit over half before heading back to the bar to do some pre-flight work so I could hopefully relax and enjoy the vacation a bit more! 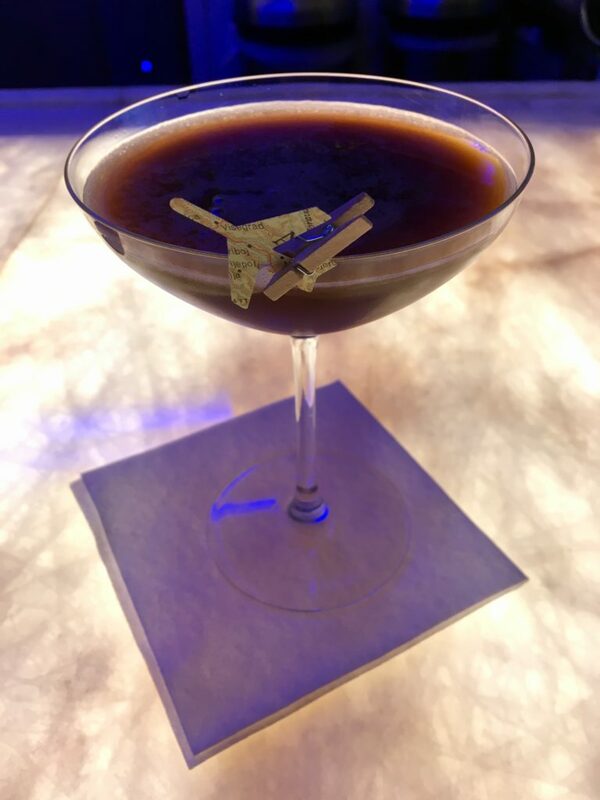 Nice chat about the “paper plane” cocktail with the lounge manager, who’s actually been sitting at the bar just about every time I visit the lounge doing some paperwork. 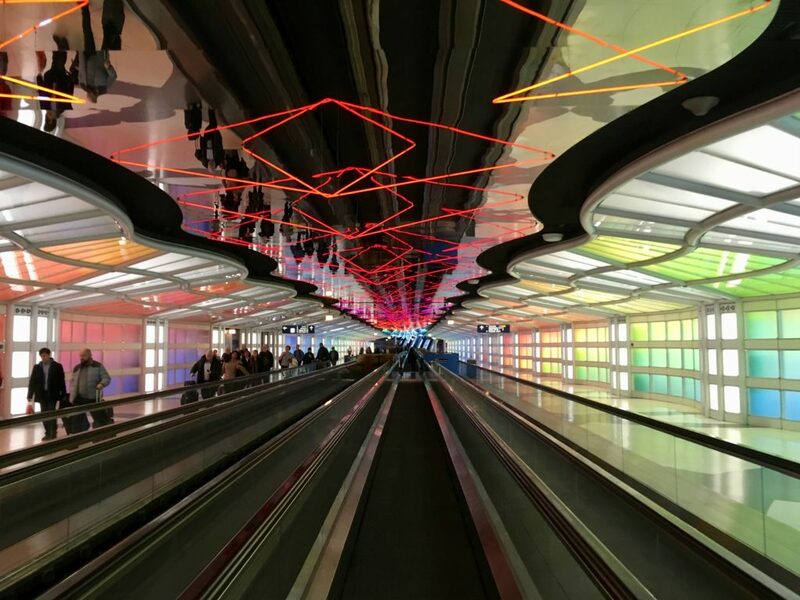 After a nice visit, back through the psychedelic tunnel to the B gates to find my Lufthansa flight. 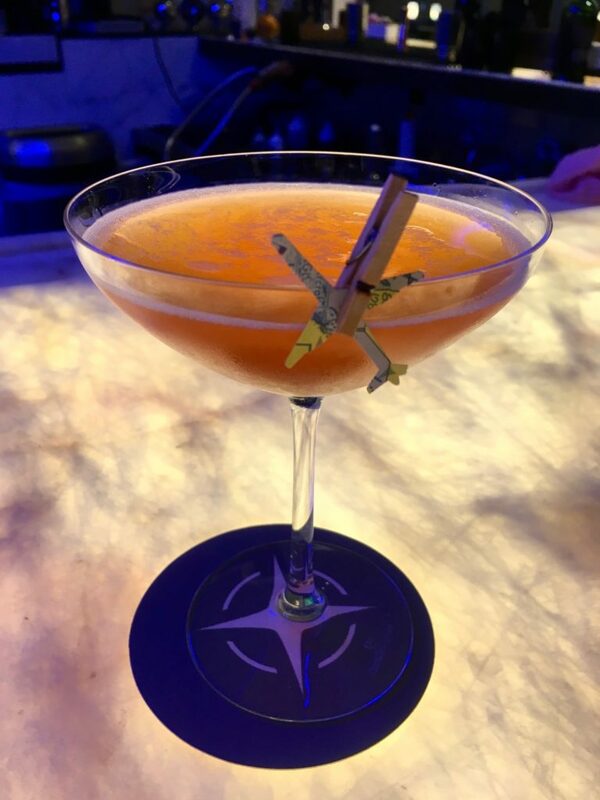 Overall impression of the Polaris Lounge? 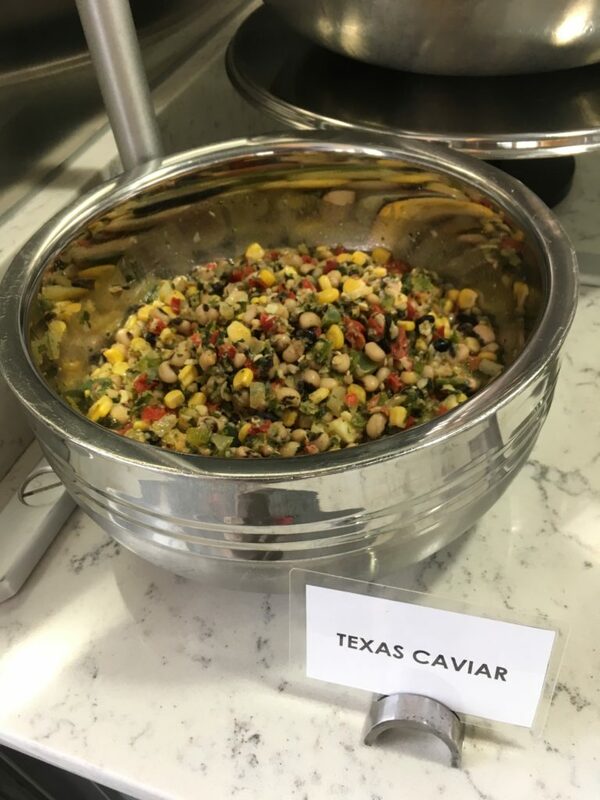 Blows away anything else in the United States with the possible exception of the JFK American Flagship Lounge. 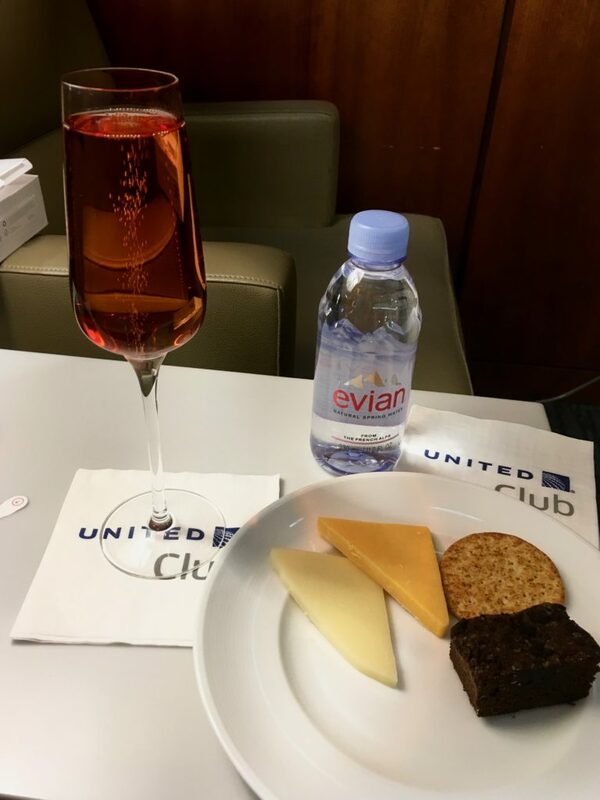 It will be very interesting when (and if) United finishes more Polaris Lounges if they manage to replicate this very high standard. Long line to board when I went to the gate, and the business class line was super long as well, so I just walked up to the counter, mentioned to the gate agent that I was in first, and was invited to board immediately so I didn’t have to stand in line. Very nice touch by the gate crew. 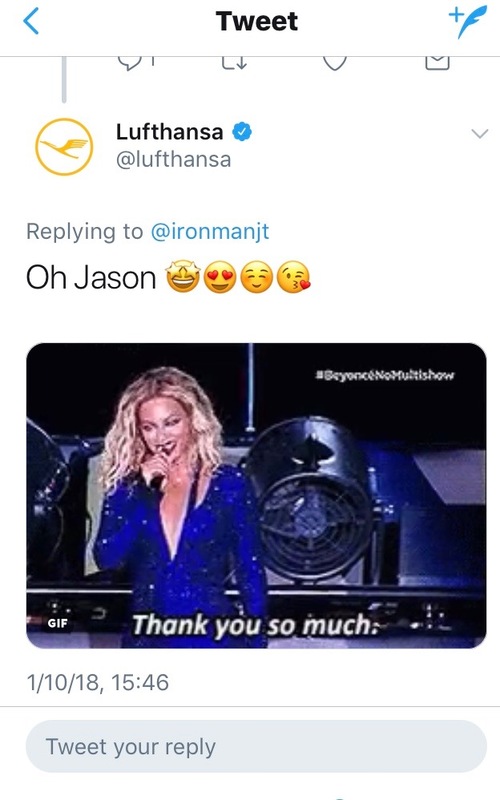 I sort of find it comical that Lufthansa social media knows me well enough that they dare reply with Beyoncé memes. 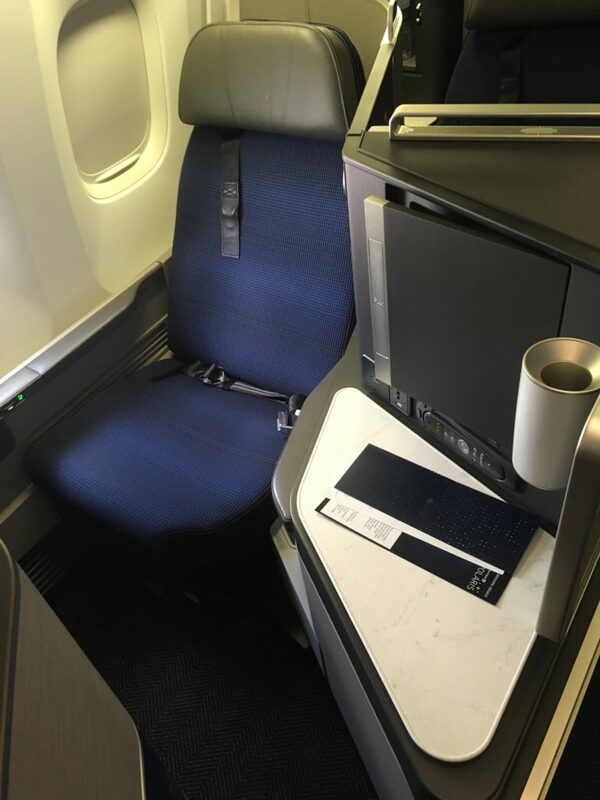 As I was the only one in first today, the crew had already made up the seat across from me as a bed for when I was ready for it later inflight. 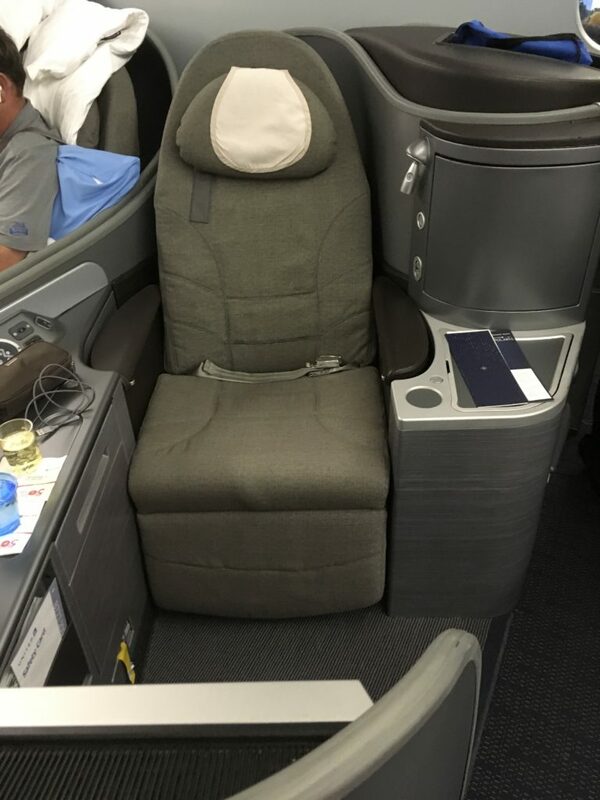 The gate agents did upgrade someone from business at the last minute, but I heard them telling the crew “he will just sleep and doesn’t need any service. We just want him to have a private bed.” I don’t know who he was that he got this treatment, but to the crew’s credit I never would have known he was there. 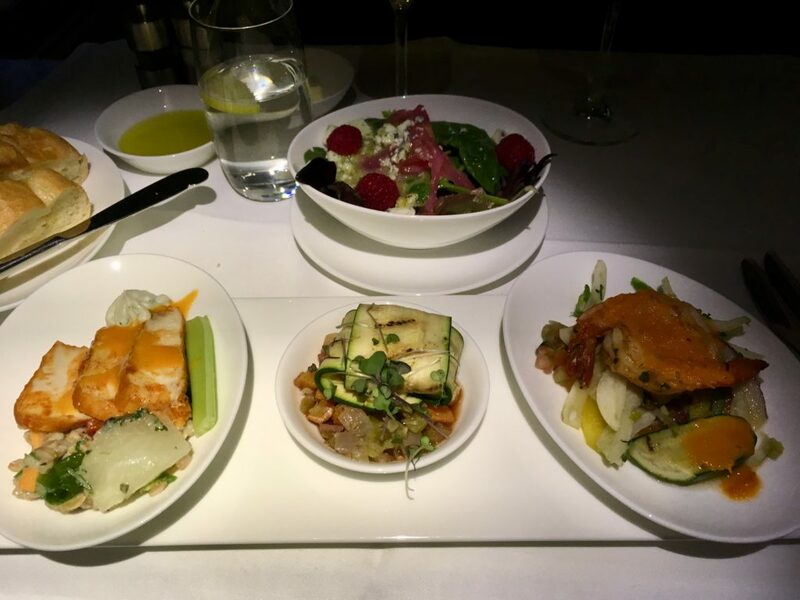 Next up were appetizers and salad: herb shrimp with fennel salad and tomato oregano dressing, buffalo style chicken, celery with gorgonzola mousseline and farro salad, and chilled ratatouille parcel with balsamic glaze. Overall, mostly a miss unfortunately. The buffalo chicken was tasty, but the rest “tried too hard” and just wasn’t great. 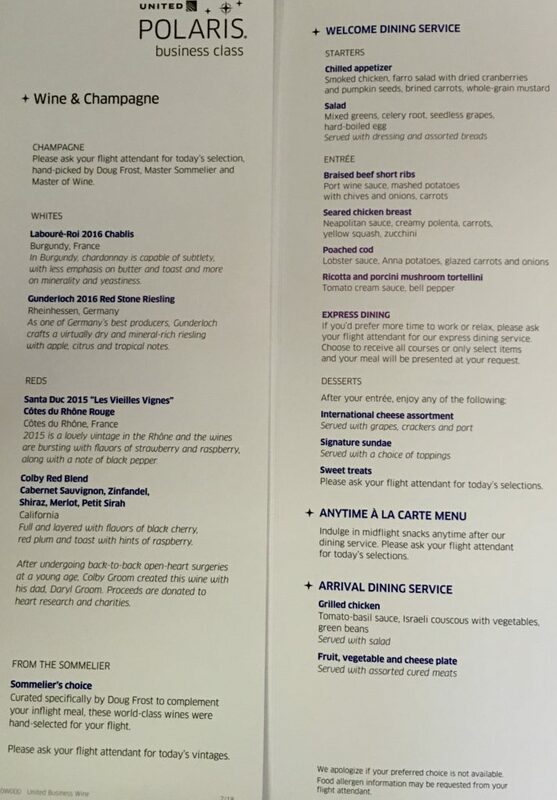 Next up, far and away the best airline main course I’ve ever had. 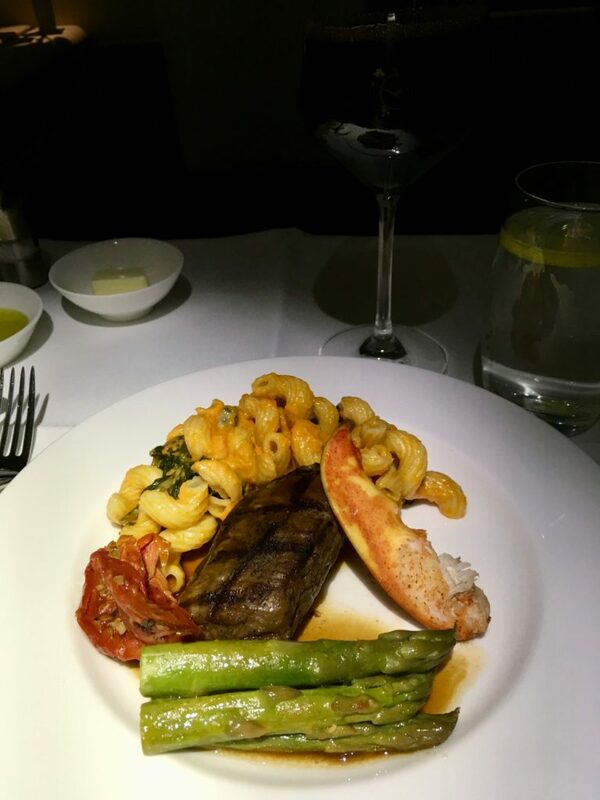 Grilled beef filet (a perfect medium) and lobster claw served with mac and cheese. The mac and cheese was just a little spicy, the asparagus was perfectly cooked, and the whole thing was a home run! 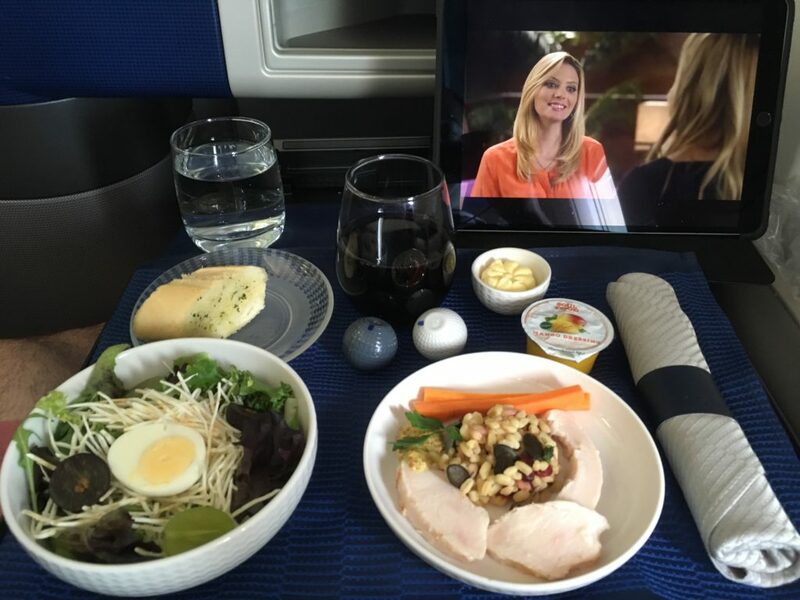 After clearing the table, the flight attendant serving first offered “can I get you a Johnny Walker Blue, one ice cube as a night cap?” Again, no idea how he would have known that unless he reads this blog or Lufthansa keeps records on their first class episodes. 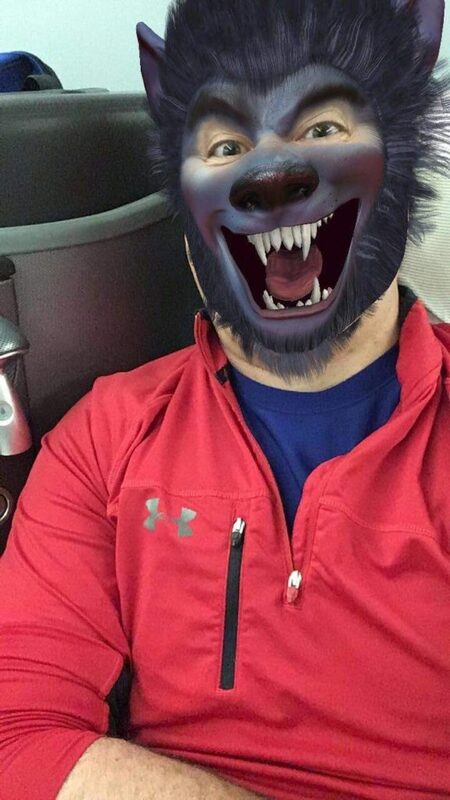 One quick check of email before calling it a night, and facebook suggested the following filter for a goofy selfie. I think they know what I was up to…. 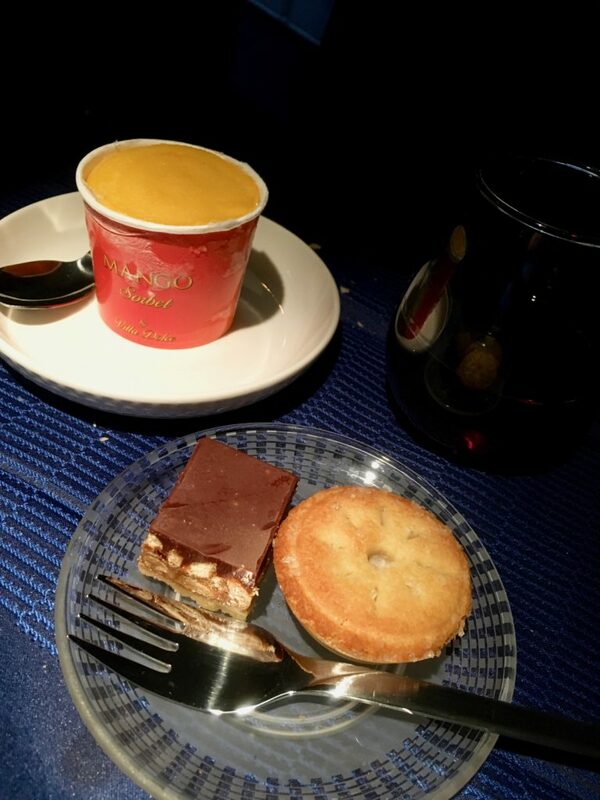 Slept nearly five hours, woke up just in time for some tea and freshening up before landing, and it was time to enjoy some time in the First Class Terminal before my connecting flights. There was something refreshing about being able to head out at 10p on a Sunday for a work trip instead of leaving on a Friday or Saturday and losing an entire weekend. I was actually able to enjoy my weekend, and only head out to the airport around 7pm to catch my flight to Frankfurt. 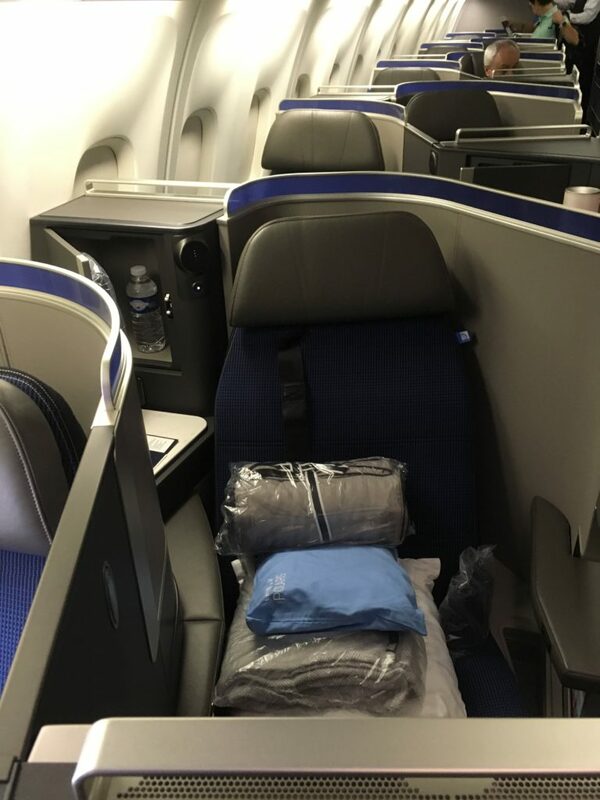 Only one small problem: I was on a J fare, and while my United upgrade to first cleared at the time of booking, Lufthansa was still holding me on the waitlist to Almaty despite first only being booked to three of eight seats. It looked like I wouldn’t find out my fate until I got to Frankfurt. 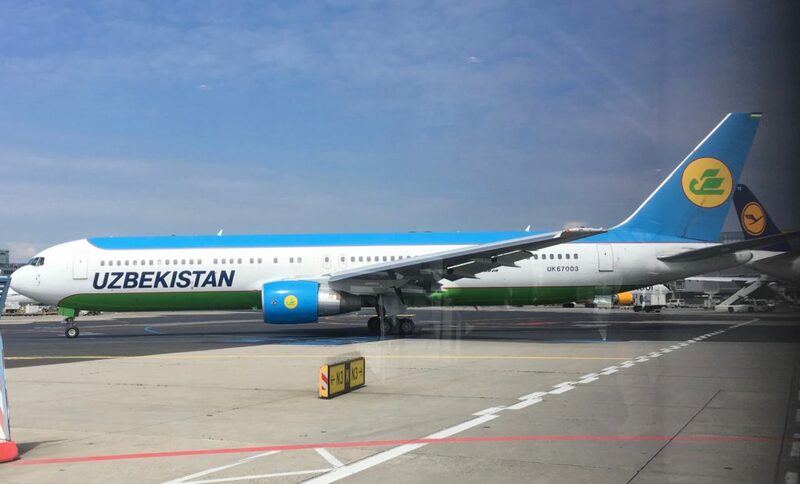 That said, Frankfurt to Almaty (via Astana) was a daytime flight, and with a 2-2-2 configuration in business it was questionable if it was even worth the upgrade. 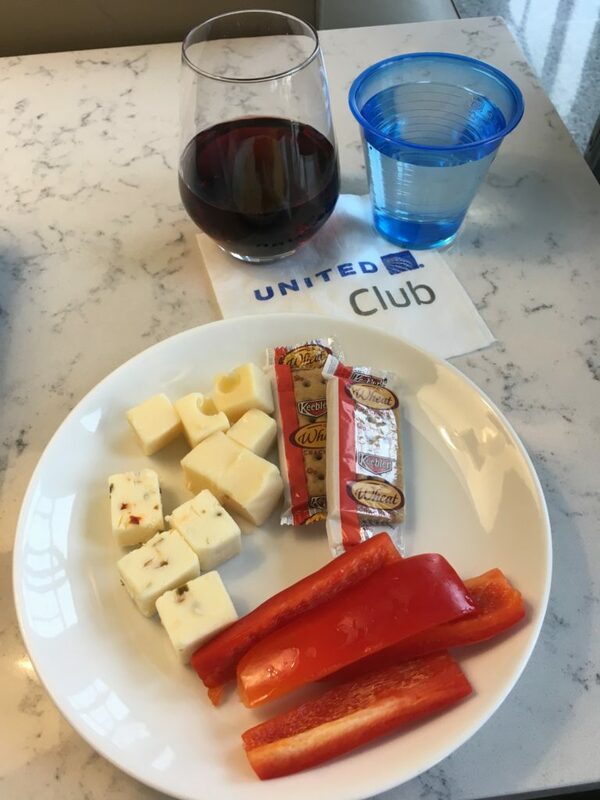 This was my first time flying United out of Dulles in about six months, and it was rather pathetic to see how United has completely given up on their first product. Premium check-in is tucked away, and there’s no separate check-in for first anymore. Even worse, the agent I spoke to didn’t know there was a difference! “We just have Polaris class now.” Sigh, it just gets worse and worse. It’s to the point I’ve already more than doubled my premier qualifying dollars, have hit the miles, but still don’t have my required four segments on United. Sigh. 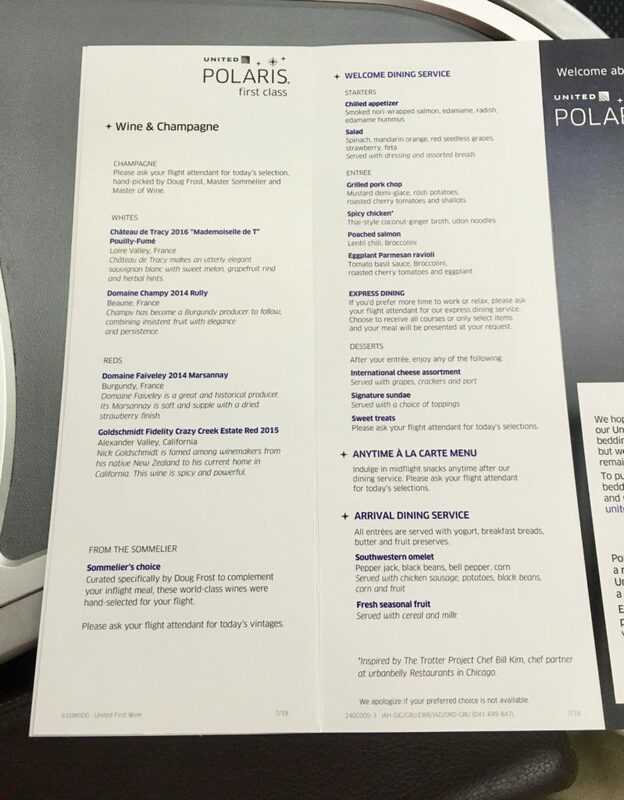 They still have the best frequent flier program in Star Alliance, however. Fast forward to the terminal, and my first task was to find some new headphones. I had left mine somewhere on a recent trip, and had forgotten to order new ones, and by the time I realized it it was mid-day Saturday and I didn’t know anywhere good in my ‘hood to buy them. So Dulles it would be. After getting to the C terminal on the walk to the Global First lounge, I came across one of those Best Buy vending machines I’ve seen the past couple years. I was intrigued by the novelty, and picked up some wired Beats earbuds from the machine. A few weeks later, and I have to say: they’re really good quality and I’m thrilled with my purchase! Got to the Global First lounge, which was absolutely packed. 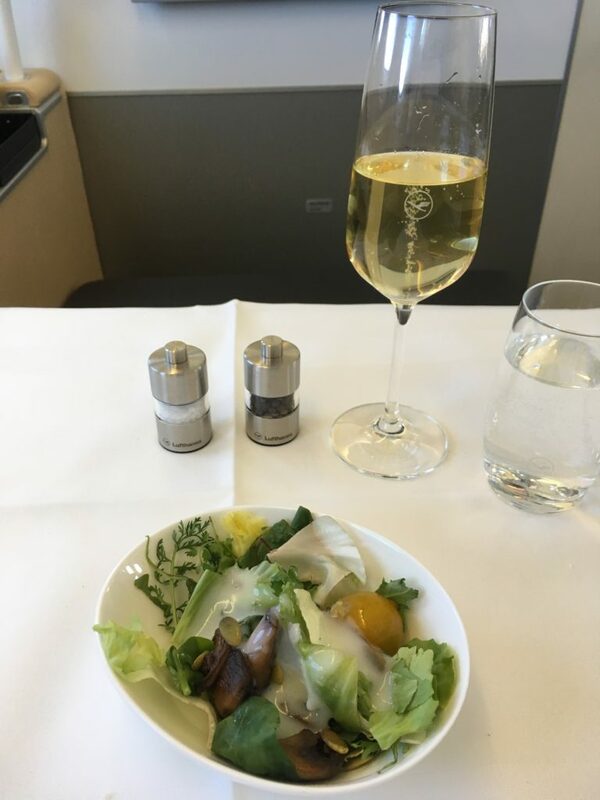 It’s my understanding they pretty much let all Global Services members in business class in now, and it was the most crowded I’ve ever seen it. High quality self-service bubbles as always, but what passes for cheese these days is absolutely pathetic. 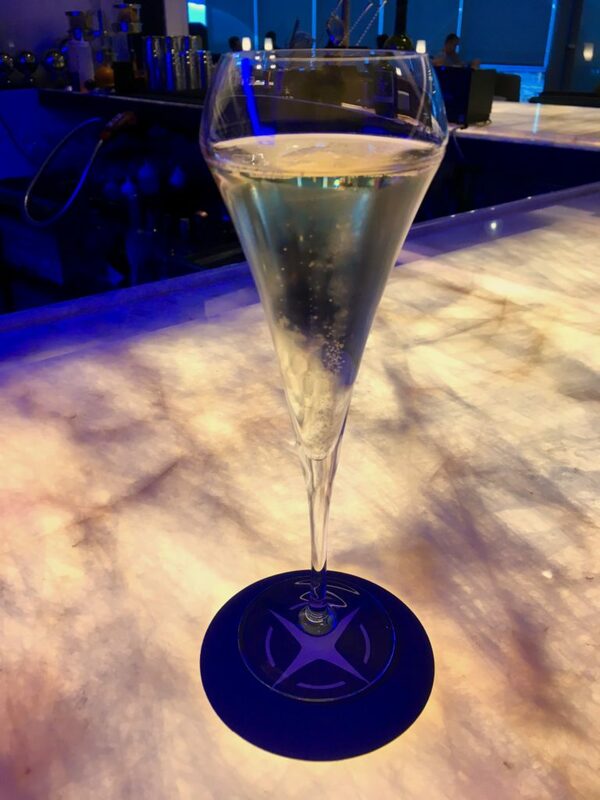 The quality of this club is now firmly below the Chicago Polaris lounge. 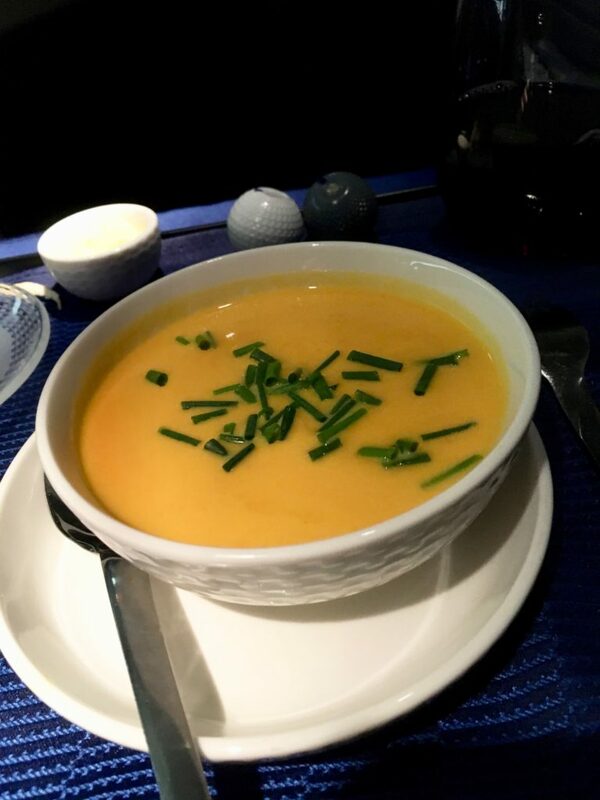 Next time, I’ll actually go to the Lufthansa Senator Lounge in the B Terminal. Wait for the flight was uneventful, and soon it was time to board. Shockingly, United First had been booked to eight of eight a full two weeks before this flight. 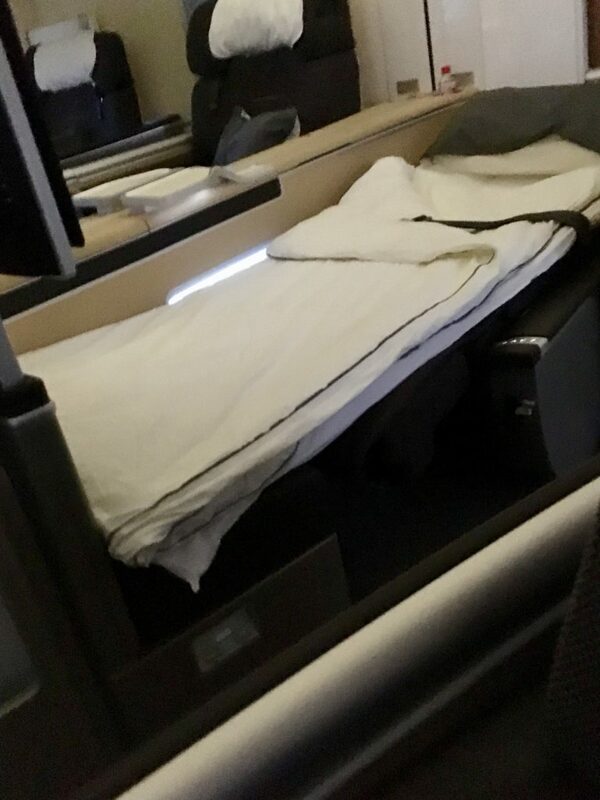 Either they gave away lots of upgrades and awards well in advance, or they actually managed to sell some first fares. Either way, in years of flying United I’ve never seen first sold out on a Europe route before the day of flight. 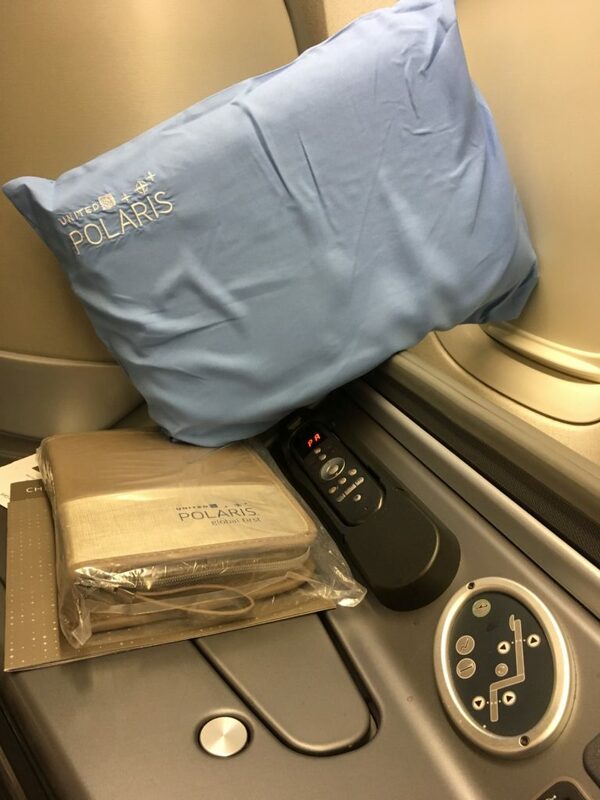 Best part of Polaris: the gel cooling pillow. This proactive crew passed them out to the eight passengers in first, and were soon heard telling the passengers behind us in business there were none left. United corporate may be failing to protect United First, but this crew was spot on. 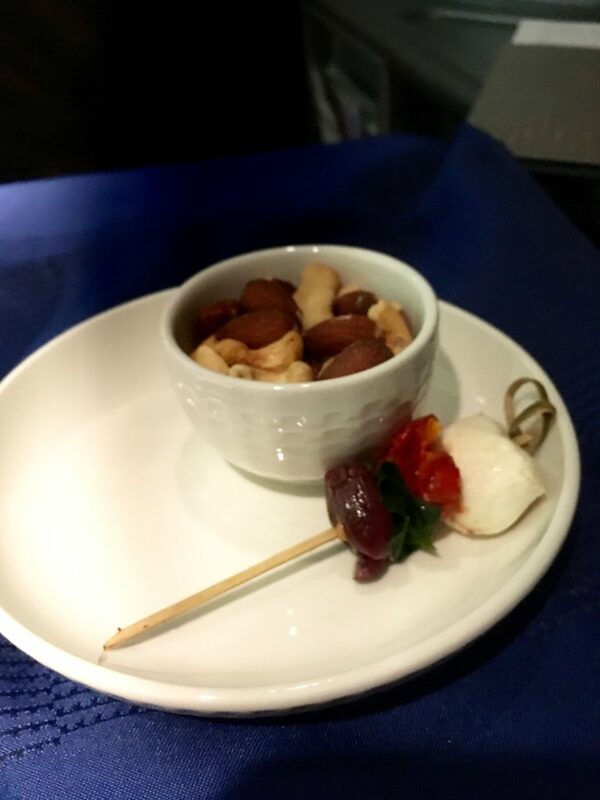 Soon after takeoff the ramekin of warm nuts arrived, complete with a skewered olive, mozzarella, and tomato. I guess its better than just nuts? 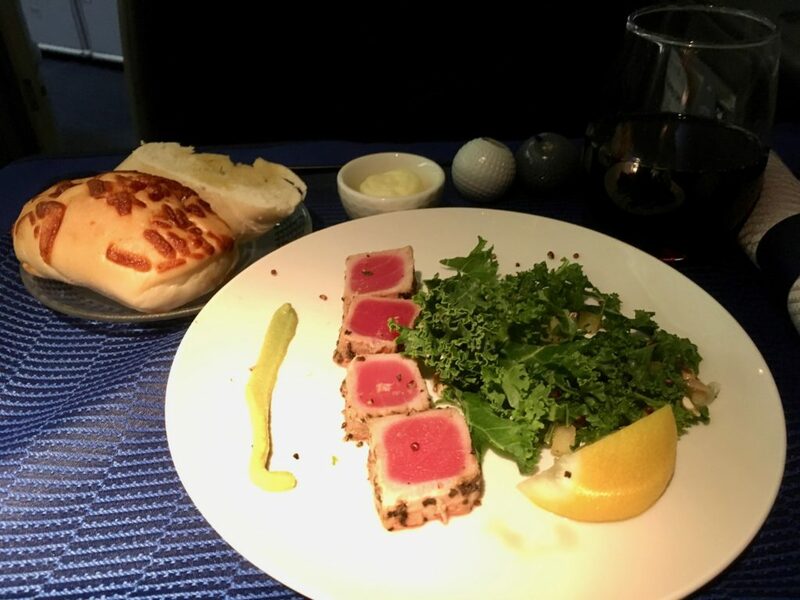 “Seared tuna, kale salad with apple and red quinoa, wasabi paste” – while the tuna looked appetizing it was absolutely flavourless, and the wasabi paste looked more like a baby turd. 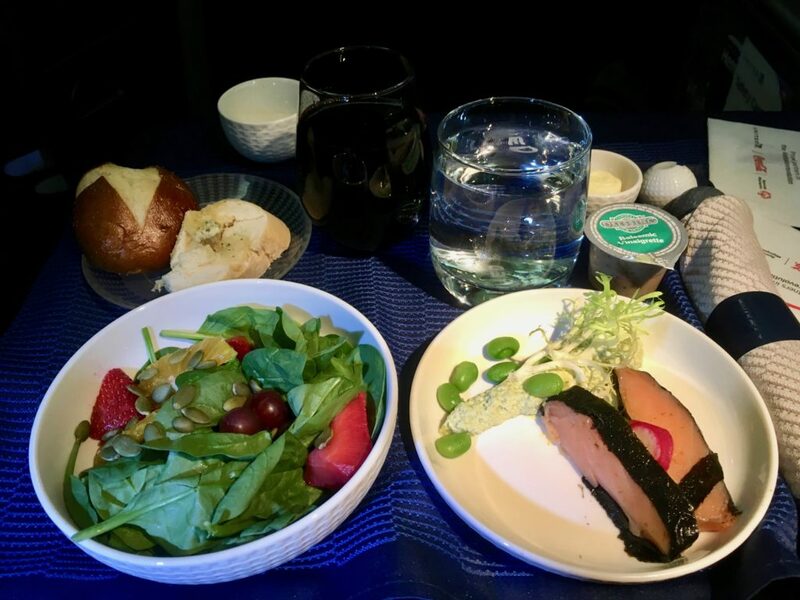 While better than some of United’s previous attempts at a business appetizer (like the single skewered prawn I got once) it still fell way short. 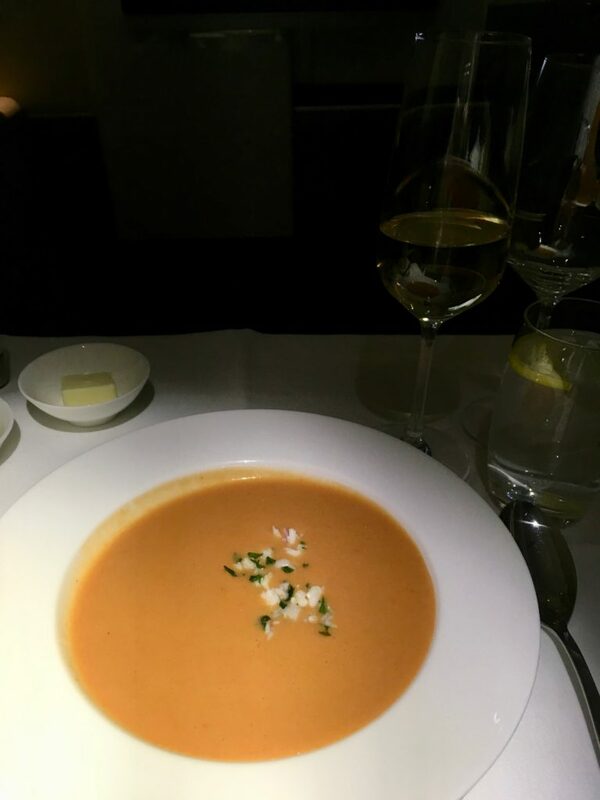 Carrot ginger bisque soup. Giving credit where credit is due, this was perfectly seasoned and actually delicious. Salad of cabbage, bok choy, carrot, mango. Just…no. Who needs that much raw cabbage in flight. 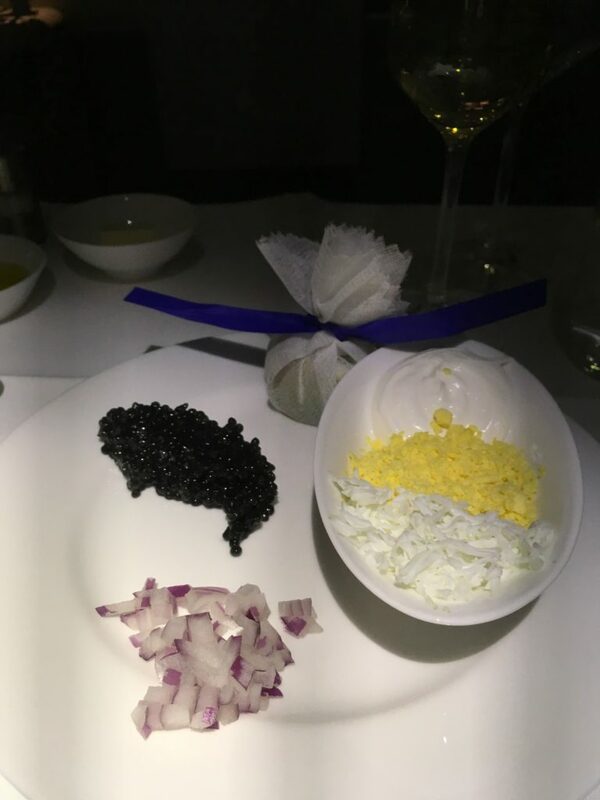 Nothing says first class like cheap shredded cabbage. 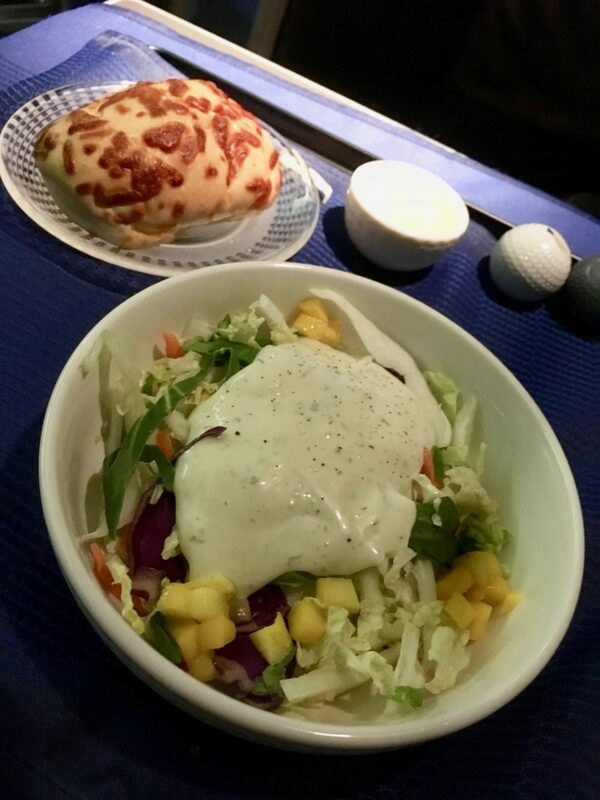 Since they’re in this picture, I will note, I love the golf ball salt and pepper shakers in Polaris. 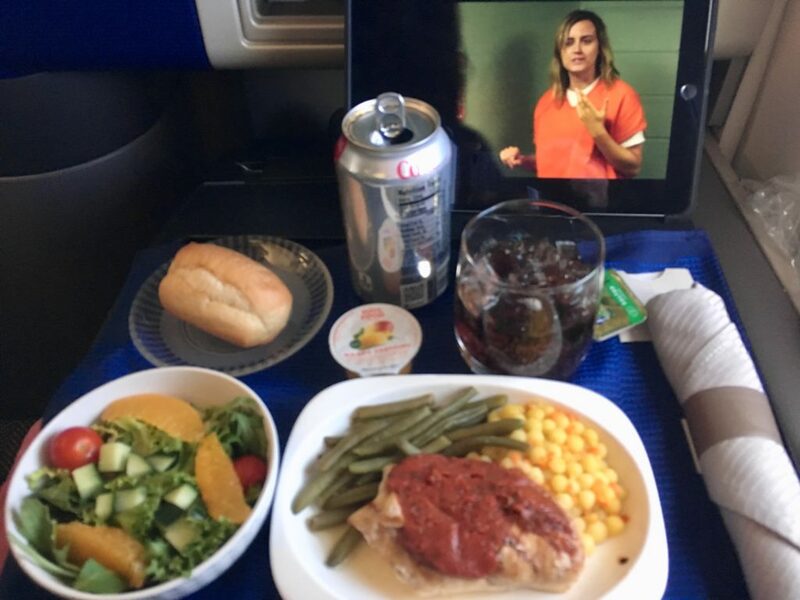 Also in this picture which I hate: first class service ON A TRAY. 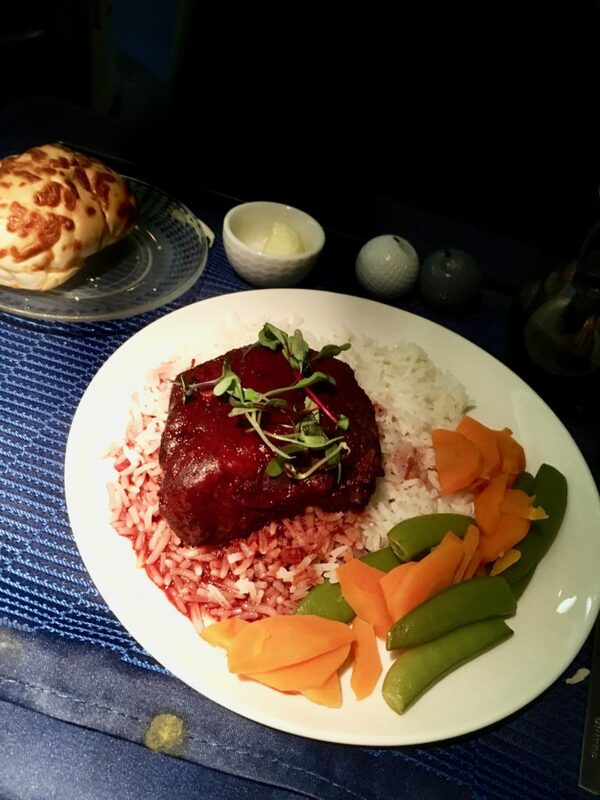 “Seared short rib” with barbecue sauce, basmati rice, carrot, sugar snap peas. I showed this to a friend who agreed the radioactive red colour of the short rib was rather terrifying. Fortunately, it tasted much better than it looked. 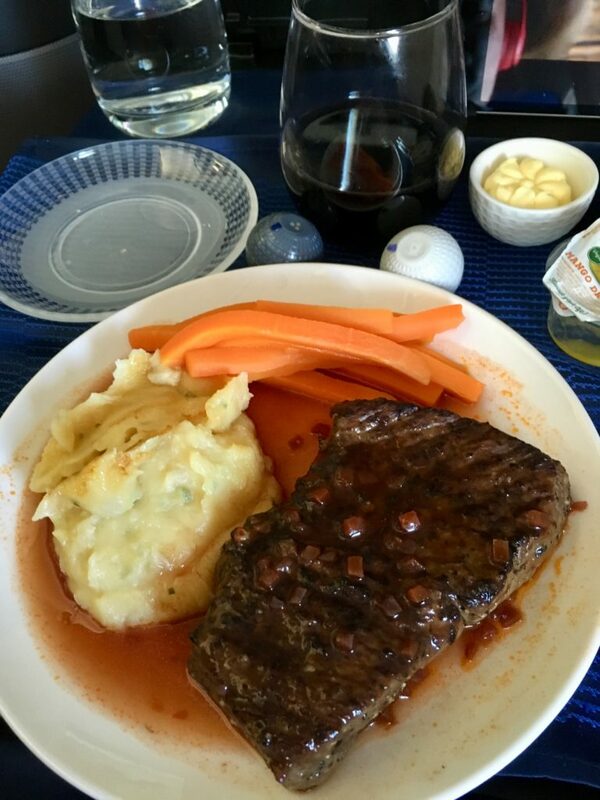 I normally hate fattier cuts of beef, but something about United’s short rib gets me every time. 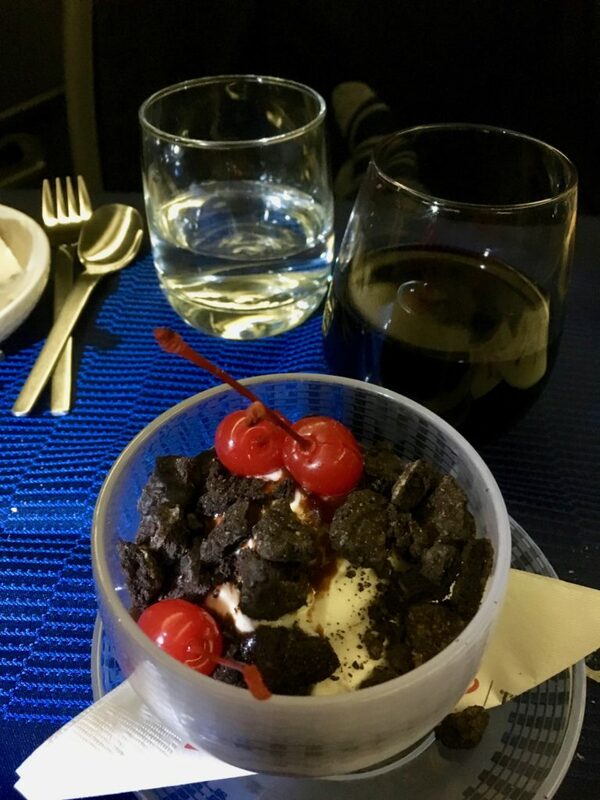 Remember when United served ice cream sundaes? Sure, it’s extremely simple, but sometimes it’s nice to have something simple that reminds you of being a kid. 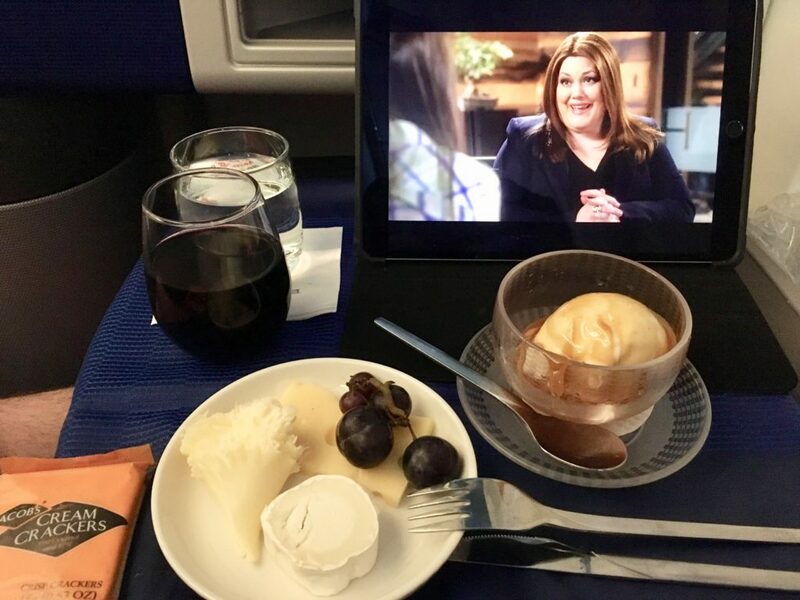 Unfortunately, the fancy new Polaris ice cream sundae dishes seem to have a habit of shattering and putting glass shards in peoples’ mouths, so United has replaced the ice cream sundae with cheap mango sorbet in a cardboard container. Gross. 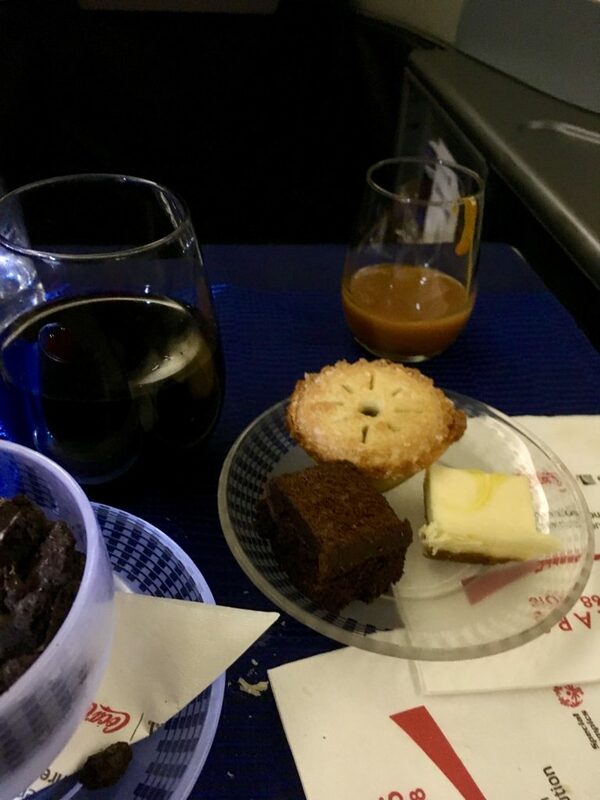 The mini apple pie and chocolate/nut bar were fairly tasty, to be fair. Nothing more to say about this flight. 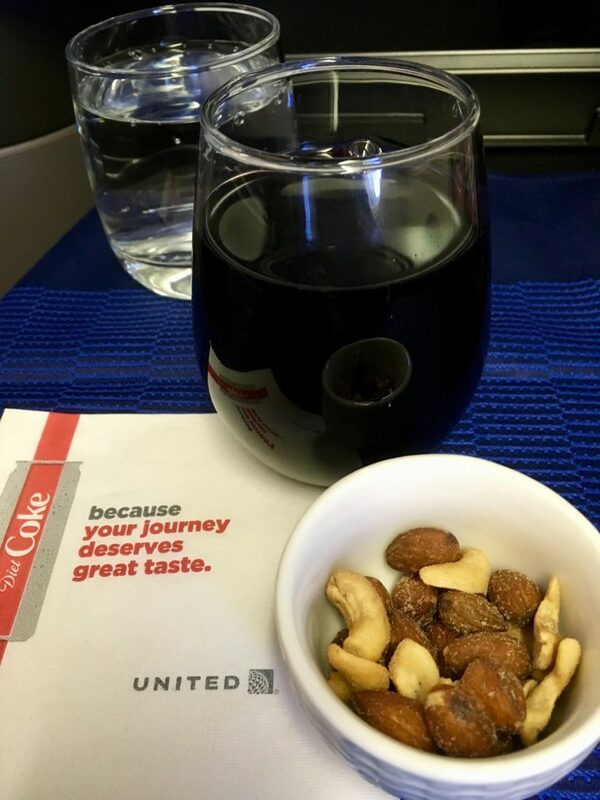 I chose the flight for three reasons, and United delivered on all three: the late 10pm departure time, a nice cool cabin for sleeping, and generous pours of red wine which enabled nearly six hours of uninterrupted sleep on the way to Frankfurt. 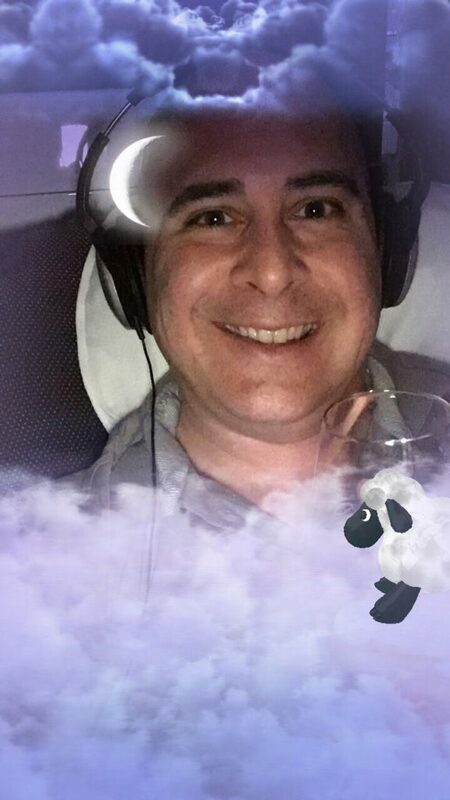 Sleep was so good, actually, that I was out cold until 10 minutes before landing. I had ensured the crew 10 minutes would be enough to bring me to life, and they kindly obliged. I feel the need to mention again this crew was fantastic, and it’s sad United didn’t give them more to work with and be proud of. Fortunately for me, my flight today would be departing from a bus gate, meaning I got a ride to the plane. 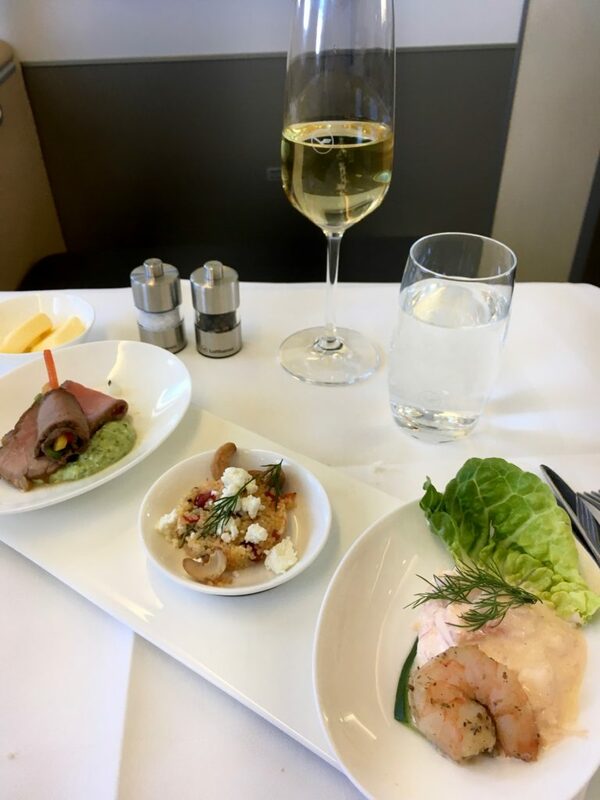 They may have waited until the very last minute to confirm me, but I was going to get the full Lufthansa First service today. Let’s see how it compares to the Untied flight I just came off of. 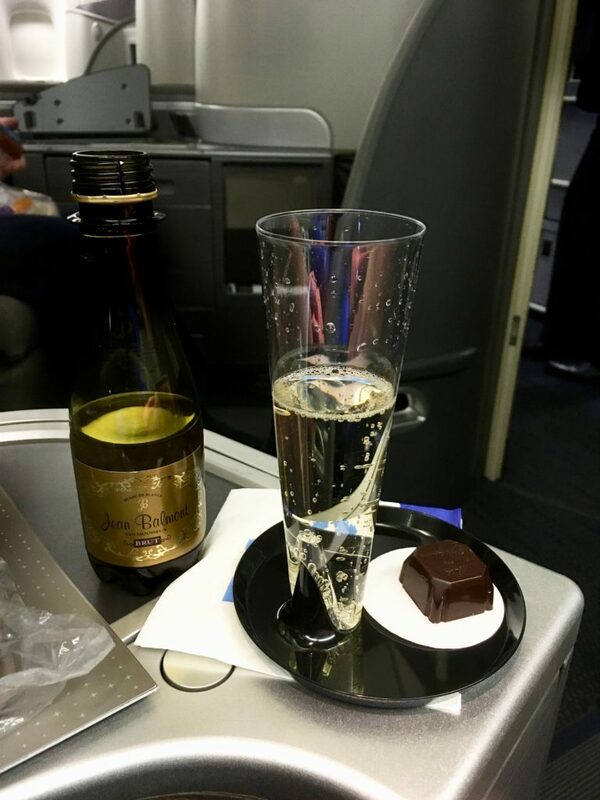 Wow…champagne…and it’s with classy nuts, not in a plastic flute, and I get a rose. 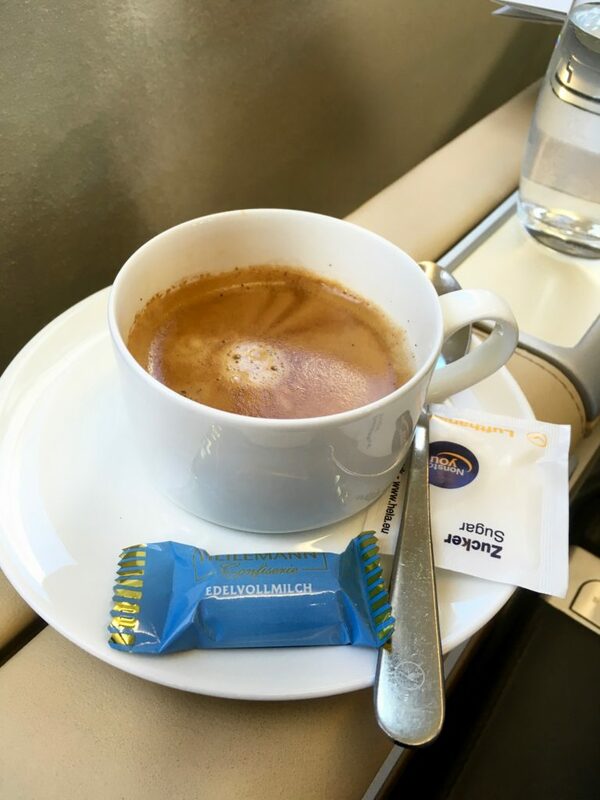 I love the little classy touches on Lufthansa. 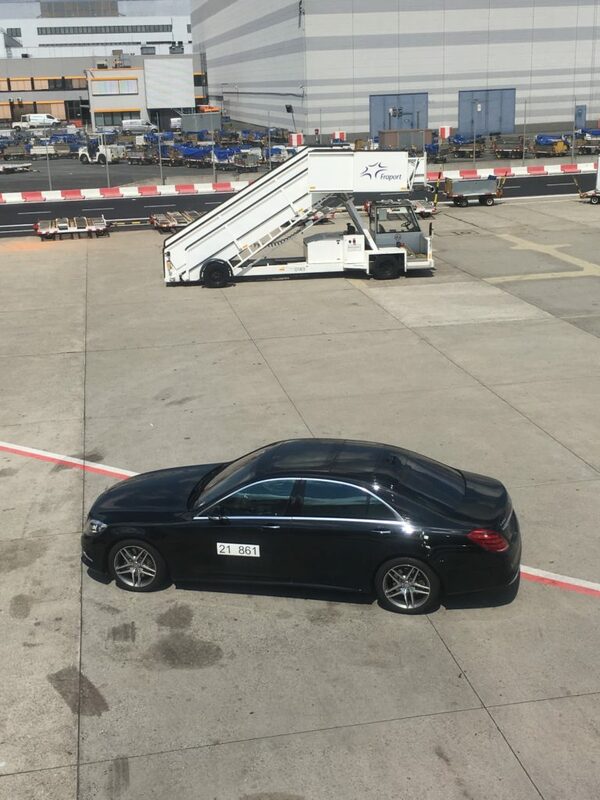 My ride to the plane…one of the things I love about Lufthansa. 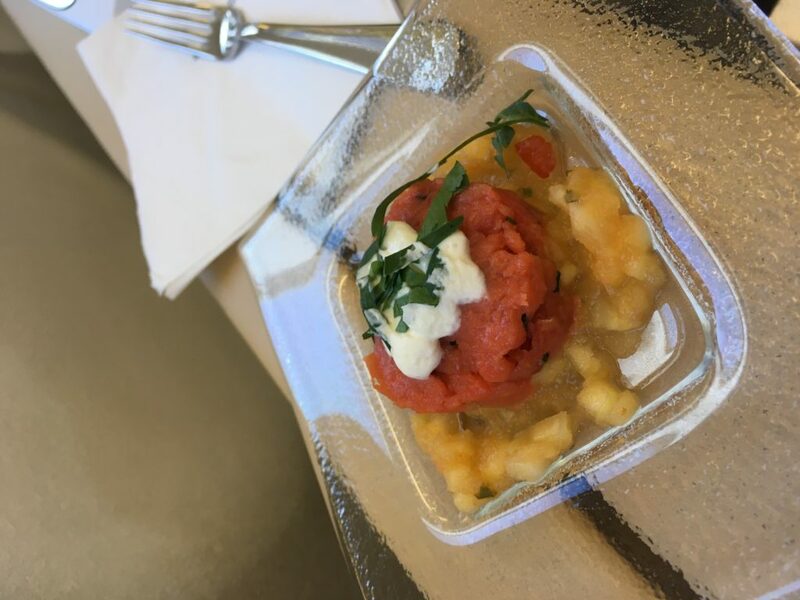 Beef tartar amuse bouche. 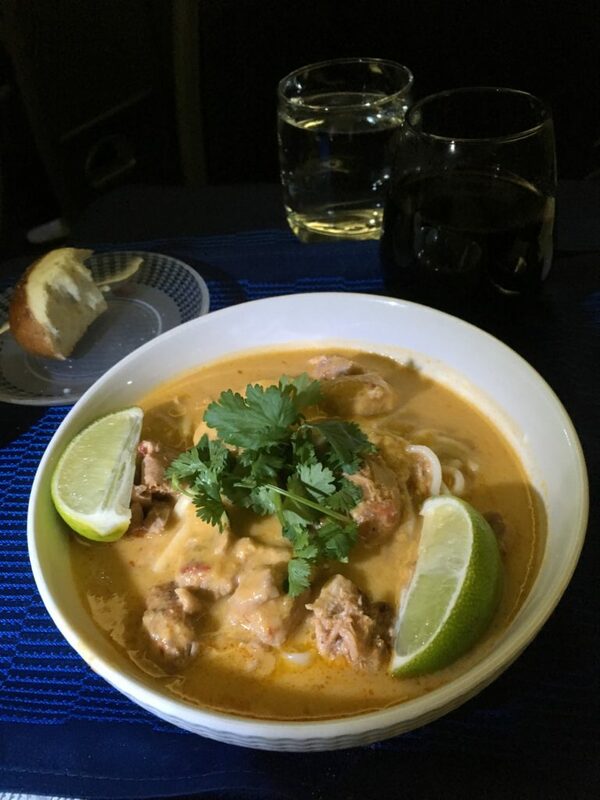 A bit risqué for an inflight meal, but super tasty with a little creme fraiche. 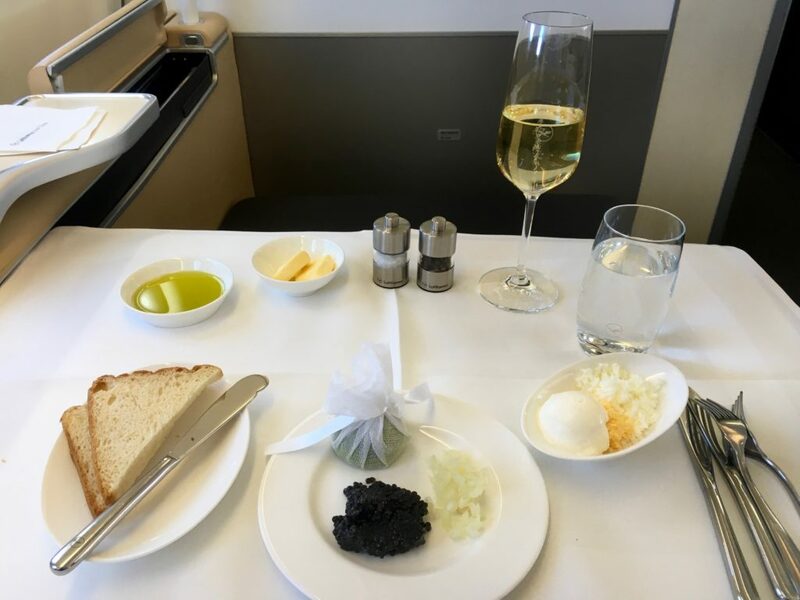 It may not be the highest quality caviar, but there is something simply elegant about Lufthansa’s caviar service which I love. Plus, they always give me an extra generous helping. 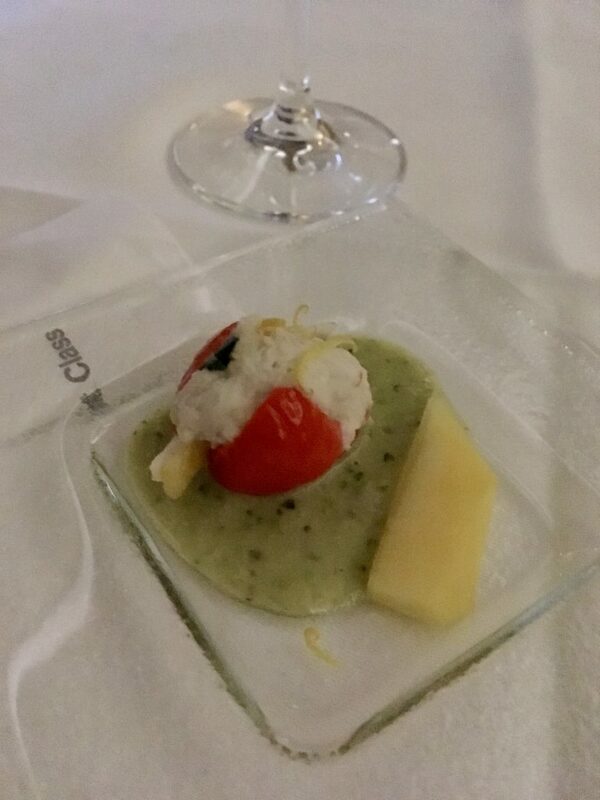 Lufthansa does an appetizer trio, and I admit that usually at least one of the appetizers is a little funky. Today was veal with turnip salad and wild garlic sour cream (super tasty), pomegranate couscous with feta and cashew nuts (also tasty), and the odd prawn cocktail. Odd because it was a single prawn with a creamy sauce that I understand is a german thing. 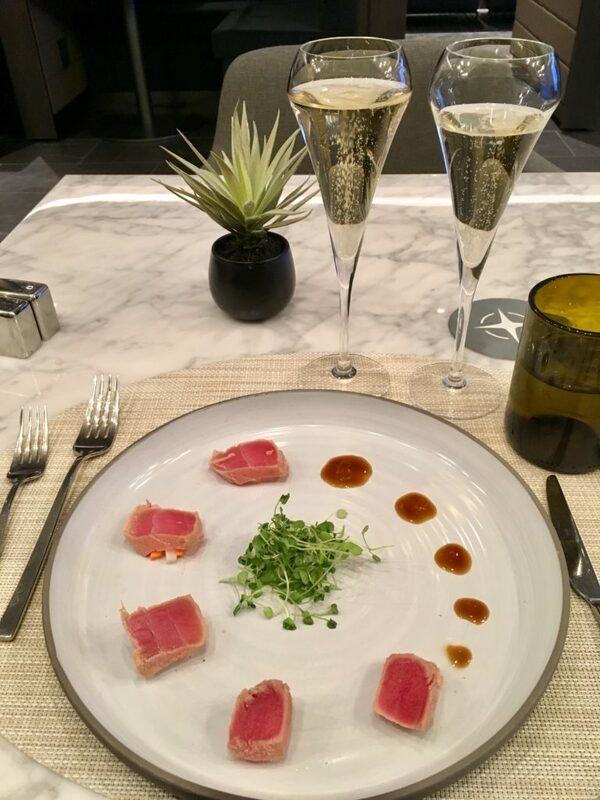 Regardless, compare this (with caviar) with the tuna nightmare United served me, and you can do the maths. Salad…it’s hard to be too fabulous with salad, and this was just ok. Mixed leaf lettuce with sauteed mushrooms, tomatoes and pumpkin seeds. 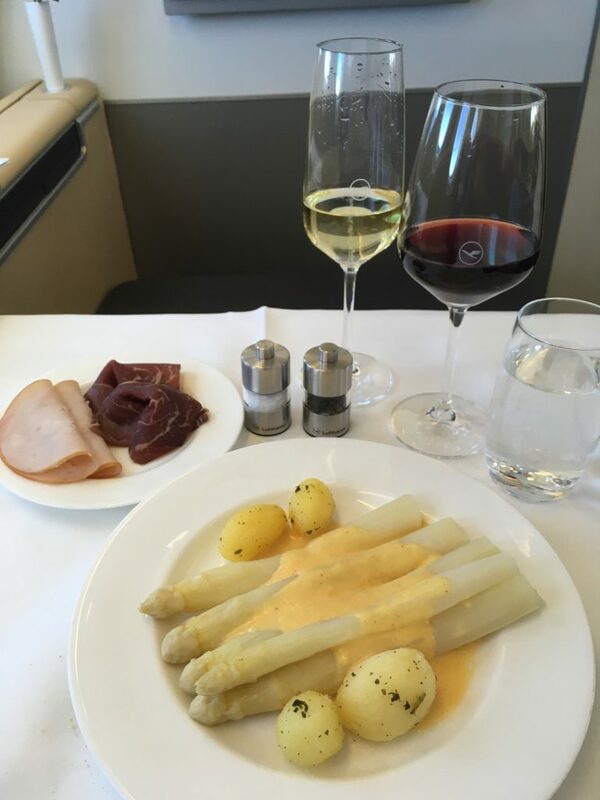 Now, I admit I don’t normally think of this as a main course, but when it is Spargelsaison in Germany you can’t pass on the white asparagus entree. I’ve had this a few times now, and I won’t lie – I’ll book trips in May just to have it again. The hollandaise sauce is the perfect accompaniment and the side of smoked turkey breast and cecina de vacuno added just enough protein to make it worth it. 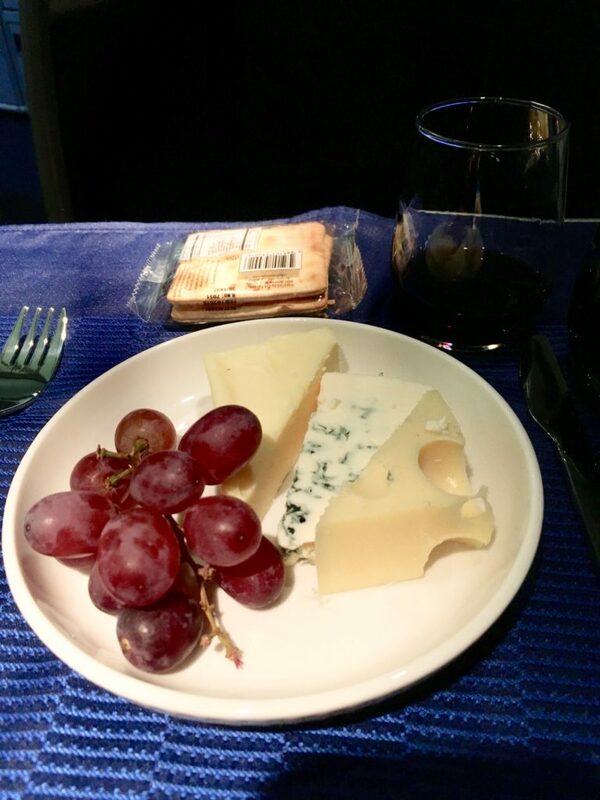 See the United cheese plate above. 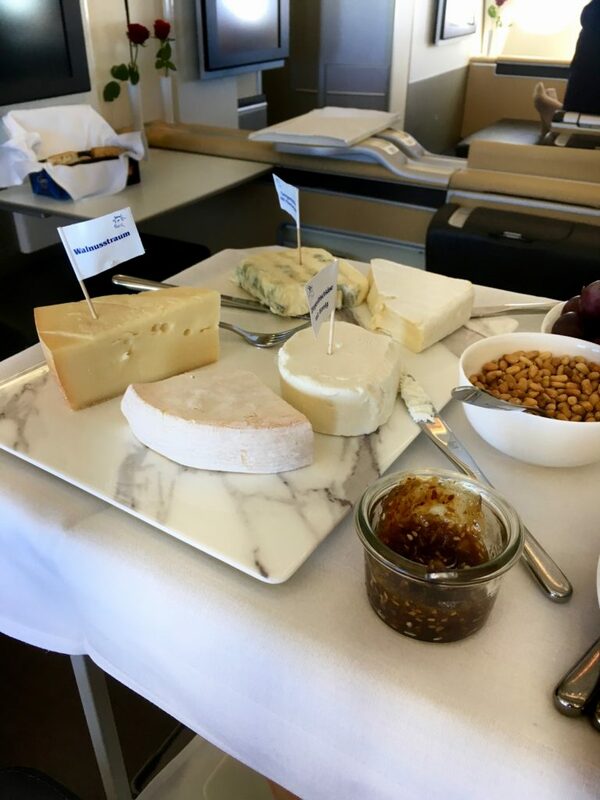 See the entire Lufthansa cheese CART below. 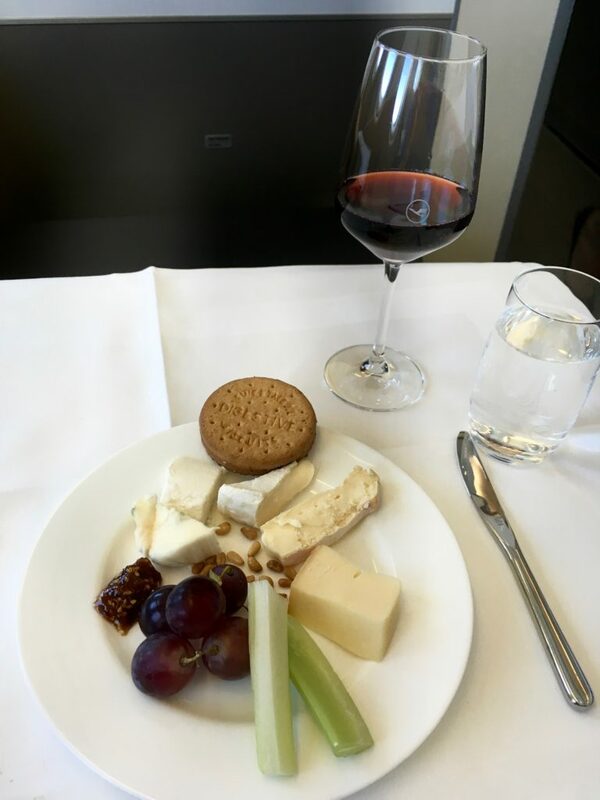 I don’t think anyone does a cheese course like Lufthansa does. The only reason the plate below is small is because I was stuffed. 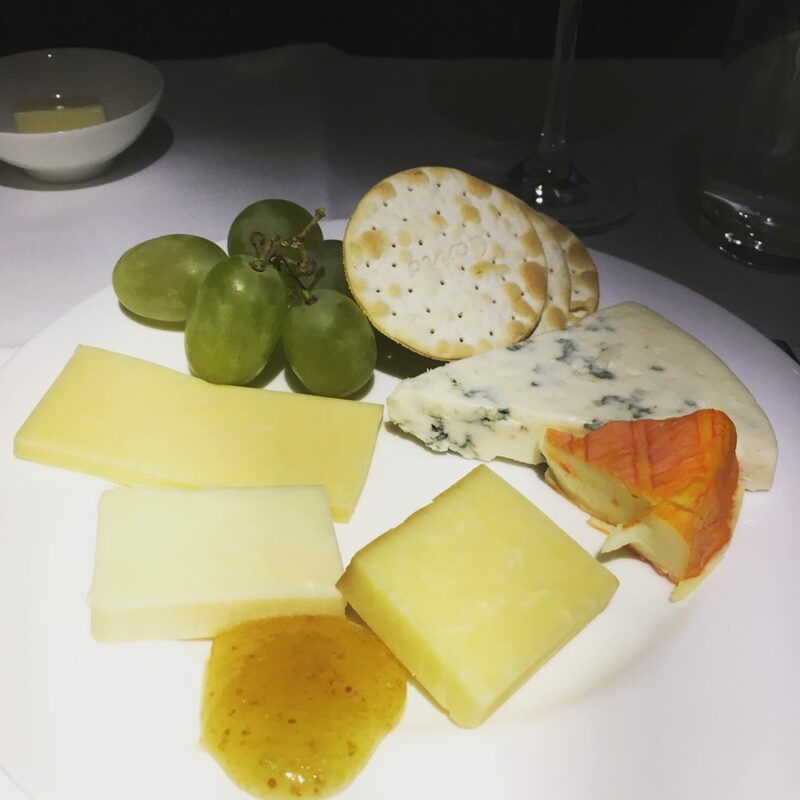 A couple of the cheeses were wonderful and I would have liked more for sure. 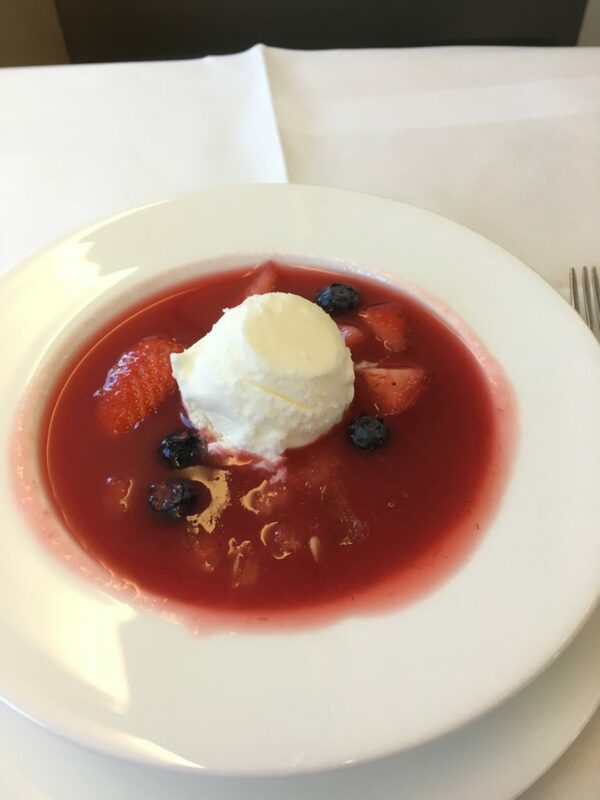 a bit unusual, but delicious: melon strawberry gazpacho with sour cream ice cream. 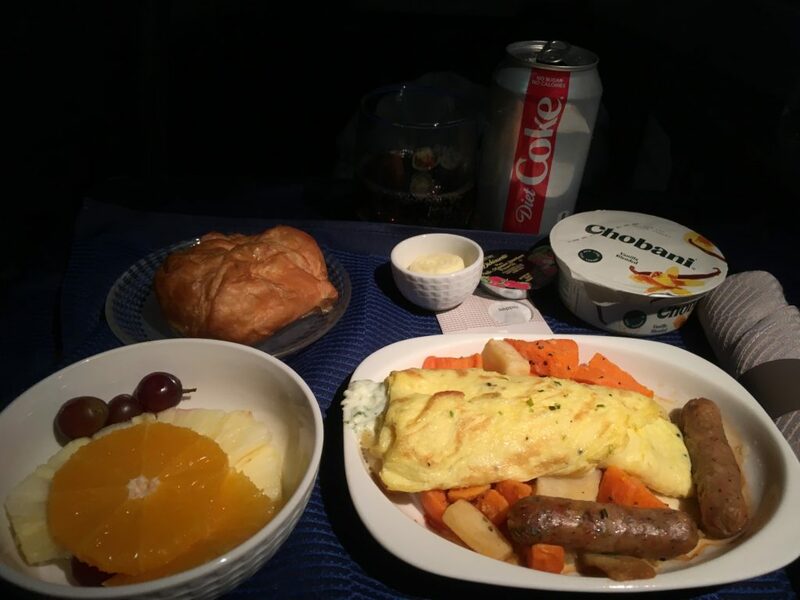 It was so good I asked for more later in the flight, but alas it had all been eaten. 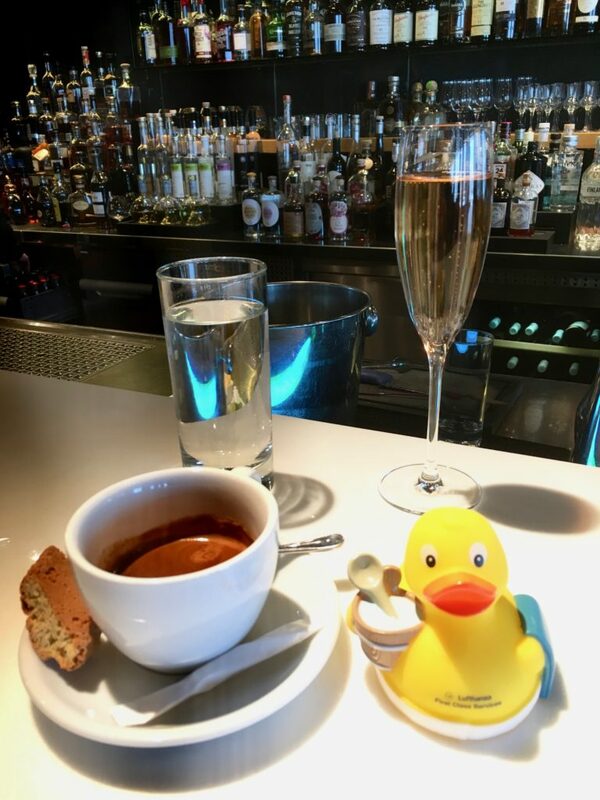 To finish it off, a delicious double espresso with chocolate. 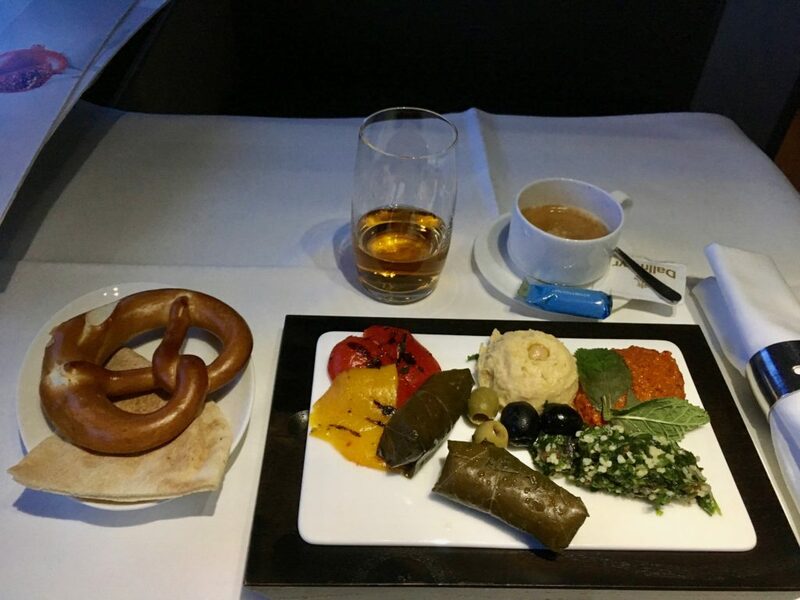 After a few hours of working, I was offered a mezze plate and pretzel before landing in Astana for our brief stopover. Accompanied with another double espresso and some Johnny Walker Blue of course. 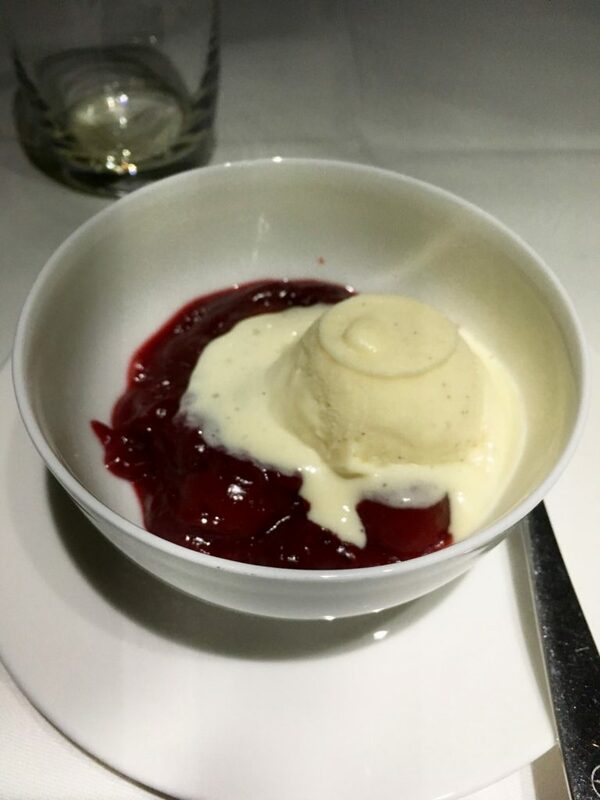 Since there was no more gazpacho, it was insisted that I have the tahiti vanilla ice cream with warm cherries. I love cherries, and these were nice and sour and perfectly delicious. Two for two with the desserts tonight. Sure beats pre-packaged mango sorbet! When we landed in Astana, 90% of the passengers got off. 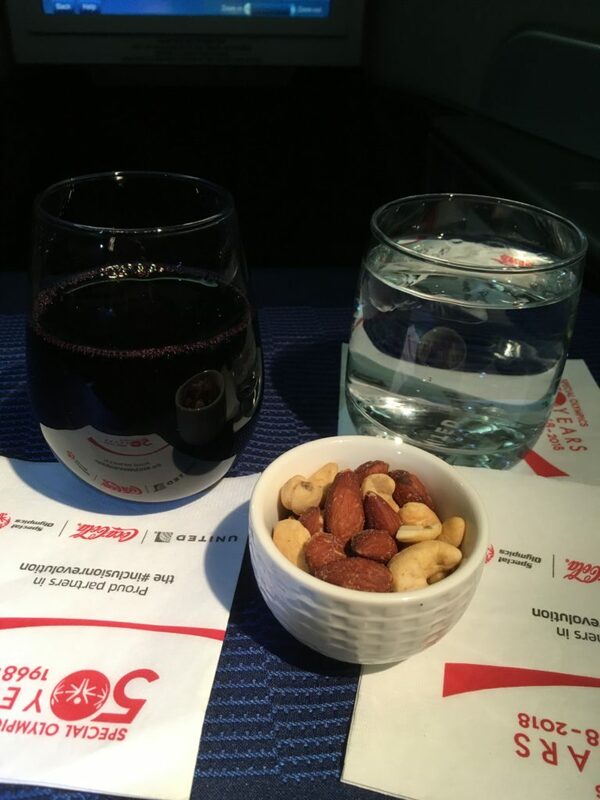 This was quite in contrast to my last time on this flight maybe six months ago when almost everyone was going to Almaty. Today, it would be just me in first class, three people in business class, and according to the crew maybe 40 in economy. 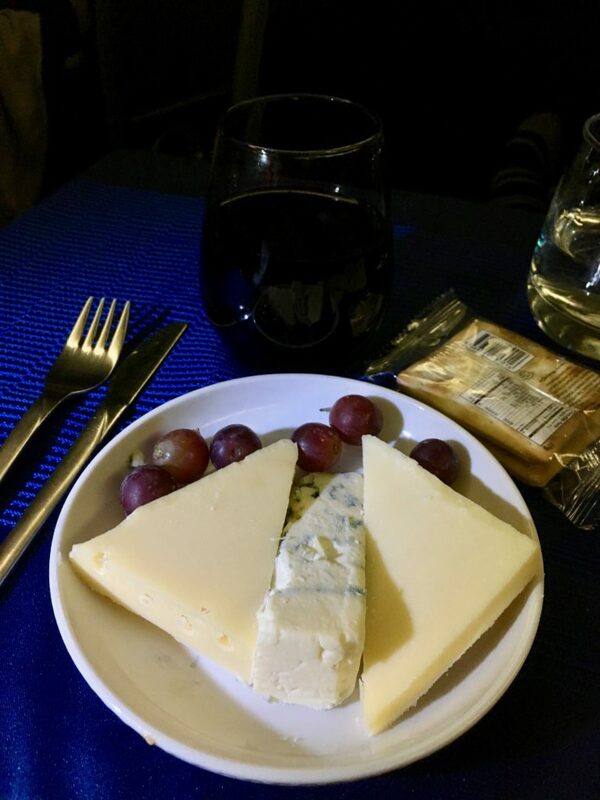 I was offered a snack of some sad sandwiches on the segment, but opted to just relax and have a couple of Johnny Walker Blues before landing. 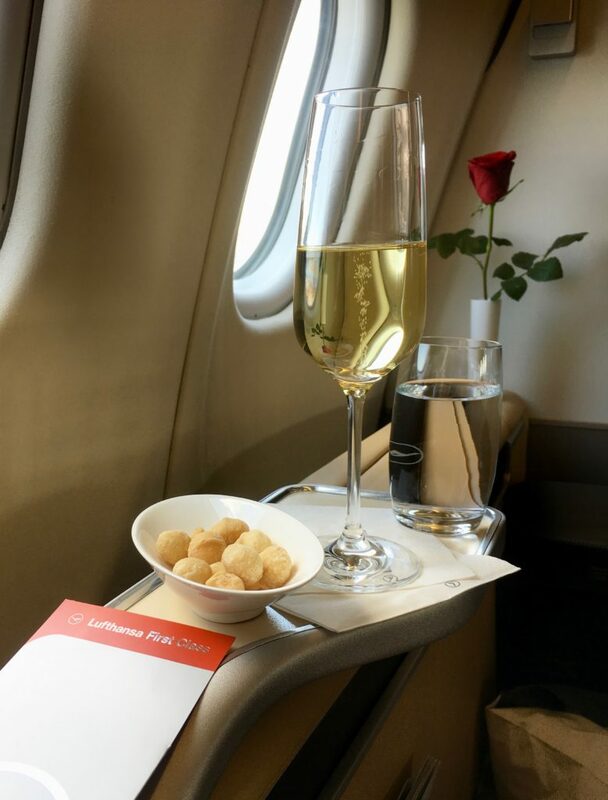 Watched some more tv, and before I knew it another fabulous flight in Lufthansa First was unfortunately over. Now, time to get to Kazakhstan and get to work!